Drivers and Pedestrians Alike - Slow Down, Watch for Each Other, Together, Help Improve Safety! A common concern that comes to the attention of the Traffic Bureau is drivers failing to yield to pedestrians. We have seen several pedestrian involved collisions in recent weeks, so this is a good time to remind drivers and pedestrians alike of safety precautions. Pedestrian actions as well as drivers actions are governed by the Vehicle Code. Drivers must yield to pedestrians at crosswalks and intersections, even when there is no marked crosswalk. Use caution when approaching a crosswalk and if you have time to safely stop, yield to the pedestrian waiting to cross. Remember, if the pedestrian has made eye contact with you, they are probably ready to cross. If the roadway is divided, allow the pedestrian to walk past the center line or median before pulling through. 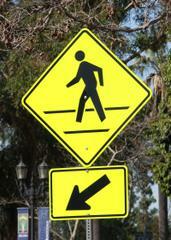 If it is an undivided roadway, allow the pedestrian to walk well past the half way point in the road. Always check the curbs and look to see if someone is "darting" off the curb or entering the crosswalk late. Drivers and pedestrians both need to exercise caution and courtesy. Never pass a vehicle stopped at a crosswalk. Approach with caution and make sure the roadway and crosswalk have cleared. Turning traffic at intersections is also dangerous for pedestrians. Even though you may have a green as a driver, you must still yield to pedestrians. Drivers making right turns must look and allow the pedestrian to step off on the green. Drivers making left turns across the intersection must make sure that not only is oncoming traffic clear, but that there are not pedestrians in the crosswalk in the path of their turn. Again, use courtesy and common sense. If the ped is well across the intersection or past the median point, you may complete your turn. If the ped is approaching you or on your side of the roadway, YIELD to them! The DMV has a page dedicated to right of way rules regarding pedestrians, crosswalks, and other situations. Take a look for additional information. Pedestrians outside of a crosswalk or unmarked intersection are also held responsible by the Vehicle Code. The pedestrian may only cross the road when safe to do so and must yield to traffic. The pedestrian may not cross between two signalized intersections. This is what is known as "jaywalking". With dark evenings upon us, it is imperative we all slow down and watch carefully for pedestrians since our visibility is limited after dark. Pedestrians...carry a flashlight, wear light colored and reflective clothing, watch for cars, and use caution before stepping off the curb. Together, we can all improve pedestrian safety.